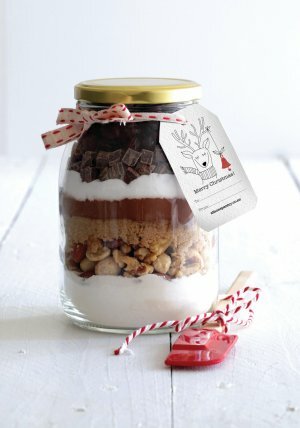 To make gift jars, place the ingredients into a jar, in the order given. Seal jar tightly. Label with the following cooking instructions. Preheat oven to 160°C. Line a 17 x 27cm slice tin with non-stick baking paper. Tip all the ingredients into a large bowl. Add 200g melted, cooled butter and 4 lightly beaten eggs. Stir together until just combined. Pour mixture into prepared tin. Bake for 35-40 minutes or until an inserted skewer comes out with a few damp crumbs on it. Cool in the tin before slicing. Serve warm or cold.